The first E-trip took place in France in 2014, a 5-day road trip, on the new E –Bike by ® CUBE. A group of 6 Dutch bloggers accompanied by a photographer and a video camera man travelled through the Bourgogne region. 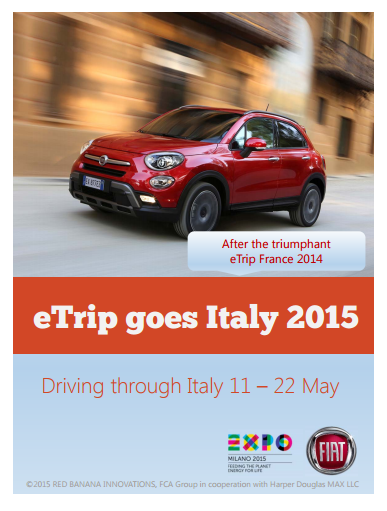 E-Trip Italy will engage tourists and buyers for 10 days and put your brand in the middle of the action ! Convert Online Visitors to Buyers for Consumer Brands! The 2014 e-Trip was about converting visitors from the web to buy the e-Bike, biking accessories, clothing and hi-tech travel biking gadgets. Participating brands were ® Garmin, Adidas, Truphone, TomTom, Leitz, AGU, Jabra, Cube, Sony en Atout France. 2015 will be about Italian brands ! Convert Online Visitors to Tourists for Destinations! The 2014 e-Trip highlighted tourism destination, hotels, gastronomy and culture of the French Bourgogne Region. More INFO en SIGN UP via this LINK! World Expo Milano 2015 in Nederland en België!